A dense network of stations is what makes bike-share work so well in these Brooklyn neighborhoods. Last night’s Brooklyn Community Board 6 bike-share forum lacked the fireworks of previous meetings — no physical threats this time. While the tone was civil, the demands from the anti-bike-share crowd weren’t exactly reasonable. So far, Citi Bike has proven incredibly popular in CB 6, with some stations getting as much as seven rides per dock each day. That’s a lot more activity than the average free car parking spot ever sees. Opponents said they would be fine with the bike-share stations if they didn’t occupy curb space that previously served as free car storage. They suggested the docks be moved onto sidewalks and that the station density be cut in half. But sidewalks in Park Slope and Carroll Gardens don’t have room for bike-share stations, and reducing station density would ruin the usefulness of the bike-share system. Bike-share only works well when you don’t have to walk more than a couple of minutes to reach a station. Geller went on to defend the density of the stations. “The density is what makes it work,” she said. “The problem comes in when you don’t have a place where you can park a bike that you’ve taken out, or where you’re not within a place where there’s a bike within four, five or ten blocks from you.” Listen to the whole thing. She hits the nail on the head. Of course, “affordable parking” comes at the expense of affordable housing. Dennis Sciria, who started an online petition called “Say No to Citi Bike,” told the audience that he wasn’t entirely opposed to the program, but that his family needed his car — and a spot to park it in. “I have two young children. I need a car. I need to get around. I need to pick them up and go shopping,” said Sciria, who said he walks to work in Brooklyn Heights from his home in Carroll Gardens. While many of the bike-share opponents were self-described “old timers” whose families have lived in the area for decades, Lori Chaumont, who moved to Cobble Hill in the mid-1960s, told the room she was thrilled that Citi Bike had finally come to the neighborhood. Chaumont, who nows lives in Park Slope, said she had hoped it would come in time for her to bike to work in Crown Heights. “I’m now retired, so I can’t ride it to Crown Heights, but I have grandchildren in Cobble Hill, so I go back and forth between Park Slope and Cobble Hill on the bike very often,” she said. Here is a twist on the Citibike and parking. Citibike makes it easier to park because you can find parking further from home and use Citibike to get to and from your parked car. I’ve done it. If only New York had a usable public transportation system that connected the Upper West Side and Brooklyn! I know, I’m a dreamer. In defense of the UWS Jeep-driving guy, it sounded like he helps out with repairs and carts around tools, etc. But yeah. There’s probably a metered spot nearby in which he can park. 5 Million people in Brooklyn, and we barely have any. He keeps a car on the UWS and advocates for subsidized car parking. Also, for what it’s worth, still saw at least 3 or 4 parents taking their kids on bike, in the rain, this morning. All this White Whine about parking parking parking — and yet, these parents are able to figure it out WITH KIDS! I love that folks think you need to own a car to get around in NYC, which has the best taxi/car service available of any city in the US. Also it’s interesting to see folks acknowledging parking is and always has been difficult; as well as folks getting flustered when the high real cost of car storage is made more obvious. Yes, that is how much it costs to build and maintain a parking structure. It ain’t cheap. And of course, providing more parking may well lead to more traffic congestion, too. Also useful for zipcar. That condo monstrosity (which I looked at as a rental) on 4th and 12th has a Zipcar lot in its basement and a citibike station. When I need to do a day trip, I can just ride down to there. Funny how this logic of “But it’s expensive!” never extends to car ownership itself. Do these people get that a lot of people don’t own cars because they can’t afford one or, even if they can, don’t want to waste the money? I really hope that at the end off all this no stations are relocated to sidewalks. Pedestrian space ought to be sacred, and many of the existing stations are already on sidewalks precisely because it allowed DOT/Citi Bike to avoid “taking” too many parking spaces in the first place. Putting stations on sidewalks to get back 10 – 20 parking spaces would be a big FU to pedestrians and to the many compromises that already went into this long planning process. I do this all the time now. It makes picking up and returning a ZipCar so much easier, and also allows me to cast a wider net when looking for better prices on a rental. take citibike fo ones parked Car ? Brilliant !!!!!! More reason for pricing parking, so this guy can find a spot. Has the City considered creating dedicated ZipCar spots on more blocks? Didn’t Hoboken do this? Somehow they managed to put Citibike Stations all over Manhattan’s UWS, which is far, far denser than Park Slope. You think nobody there wants a free curb spot for their car? Yes. Hoboken had [has?] a thing called “corner cars,” which is on-street reserved spots for car sharing vehicles. If I remember correctly from when I was there last, it also had a safety component in that the cars were parked in the last spot away from the crosswalk, leaving enough space for visibility for pedestrians. Compare to NYC, where giant SUVs and even trucks can be parked right up to the edge of the crosswalk, making it hard for people on foot and in cars to see each other. According to the source, these were seven “events” (docking or undocking a bike), not rides. An event should be counted as half a ride. This is still a much better usage of curb space than car storage, though. My local assemblyman has complained about the parking space issue. Which is weird because the only Citibike station within 4 blocks of where he lives is a sidewalk station. when a single free parking space, anywhere is lost, all cars suffer.. I used to do this with a car – ride to car, put the bike in the trunk – find a new spot (street cleaning), then ride home. Made is so much easier, because I would park places other people didn’t want to, because they were somewhat more isolated. Yes. His call for the city to provide cheap off-street parking in a neighborhood in which property sells for $1,000 a square foot was particularly ironic. I was just pointing out that he said he hauled around equipment; for social calls, I would highly recommend taking transit. If they do so, don’t rent to one of the three oligopoly companies that have taken the price of rental cars in Brooklyn to the moon. Front edge or back edge of the crosswalk? Also, Paris has a city-run electric car-share program. 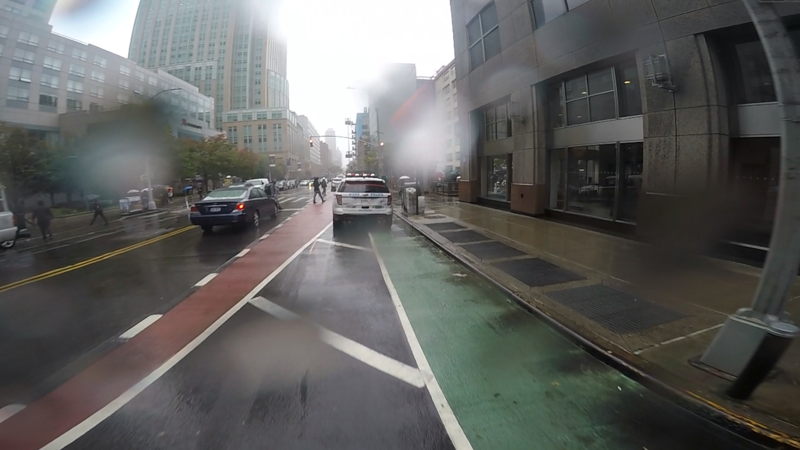 Obviously, this poor innocent driver was forced to park on the crosswalk because those darn Citi Bikes took his spot! No, they do not get that. For them car ownership is the default, and it always has been, and that money was already spent before they ever even earned it. Ignoring the astronomical price of a car is a big part of how Americans were hoodwinked into believing that cars are essential. I wouldn’t worry about DOT listening to the ridiculous demands that these docks be pushed off onto pedestrians. Citibike docks require a sidewalk to be at least 16 feet wide to allow egress, DOT just won’t do it otherwise, and Park Slope sidewalks are too narrow. Yup that’s how you sell residential parking permits, too. I was amazed at how few people spoke of the obvious solution to the problem which is pricing on street parking. Some people really do need their cars and would be happy to pay for a permit. Other people do not need their cars and would get rid of them if they had to pay to park every day. Yes, but the plate number is 9355 14 – I can e-mail you a better photo later. Do you have an e-mail submission? I live in NYC precisely so I don’t have to own a car. Like, am I supposed to drive to FiDi every morning and take an hour to get 5 miles that takes me 30 mins on bike? or between 25 and 45 minutes via train? There should be a law that no property-protection laws apply to cars parked in crosswalks (or on sidewalks): You can key them, break into them and take everything inside, take a giant saw and saw them in half, whatever, no legal repercussions. Open season. Thanks, updated the -01 ending to -14: http://www.carsinbikelanes.nyc/index.php?id=1137 (I prefer this image since it show’s the car’s tires sitting right on the green paint). 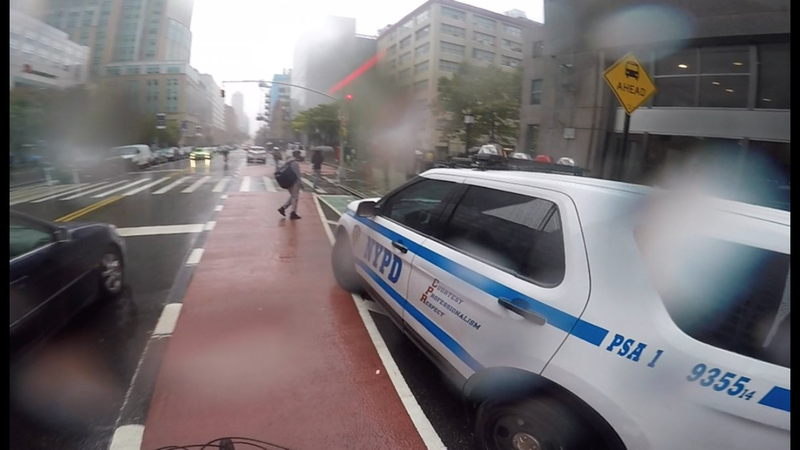 I prefer uploads to come through the form on the website, but if you email carsinbikelanesnyc@gmail.com with minimum relevant info (plate, date/time, state, location, and photo) I can certainly add it manually. I heard something recently that makes me believe San Francisco has dedicated parking for its car-share company. There are a couple hundred on-street spaces used by City Car Share, Zipcar and Getaround in San Francisco, and a handful in Oakland, too. The typical UWS Street or sidewalk is wider than those in Park Slope. The point, in any case, is that more density means less room for curbside parking. A row of parked cars is essentially a traffic lane that doesn’t ever move. A Handful of Car Spaces, or a 27-Dock Citi Bike Station?